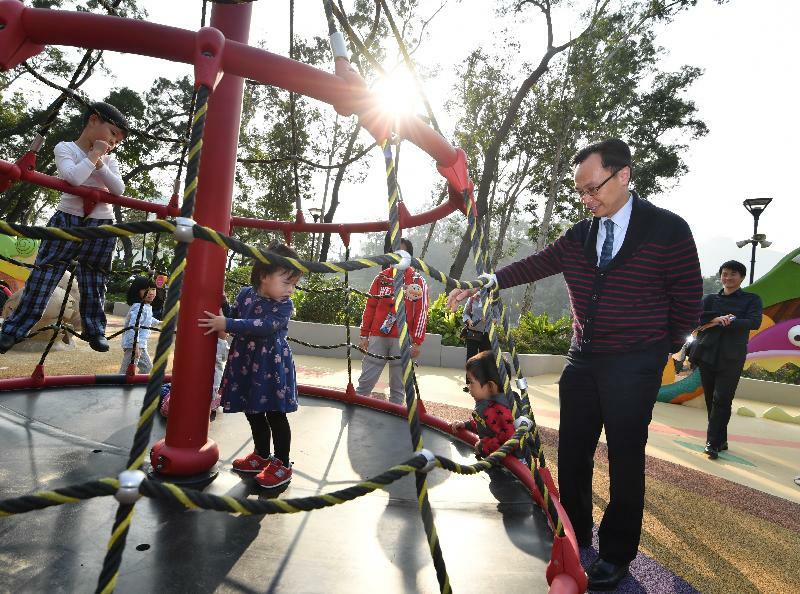 The Secretary for Constitutional and Mainland Affairs, Mr Patrick Nip, visited Tuen Mun District this afternoon (March 11), where he met with members of the Tuen Mun District Council (TMDC) and toured an inclusive playground in the district, as well as calling at T·PARK, the first self-sustaining sludge treatment facility in Hong Kong. The Under Secretary for Constitutional and Mainland Affairs, Mr Andy Chan, also joined the visit. 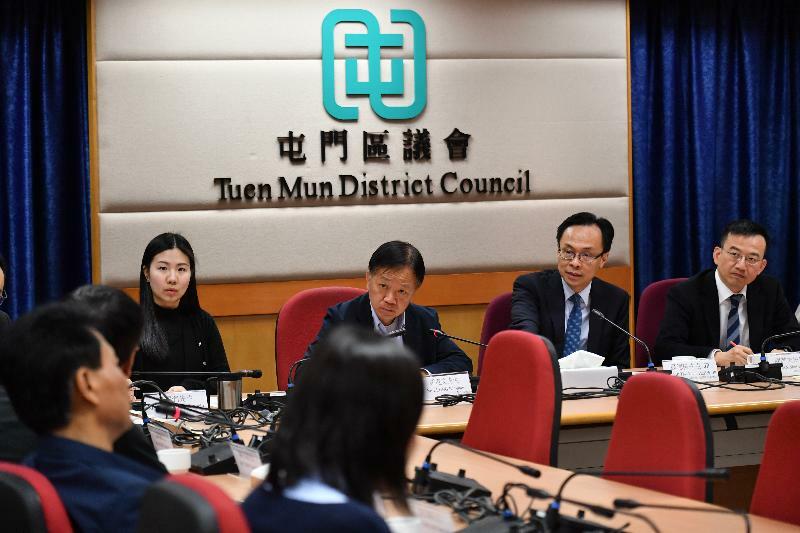 Accompanied by the District Officer (Tuen Mun), Ms Aubrey Fung, Mr Nip first met with the Chairman of the TMDC, Mr Leung Kin-man, and members of the TMDC to exchange views on district and community affairs. Mr Nip then visited the inclusive playground in Tuen Mun Park. This playground is the first barrier-free play space for children in Hong Kong incorporating two natural elements, water and sand, in its design. He said he was glad to learn that the facilities and the play components were specially designed to cater for children of different ages, abilities and physical condition, so that they can enjoy the same playing experience and acquire various skills in the course of playing, thereby fostering the balanced development of their body and mind. Parent-child facilities are also available in the inclusive playground, whereby parents and children of different physical abilities can enjoy the fun of playing together, thus enhancing the parent-child relationship. Mr Nip said, "Children's growth and development is one of the priority policy areas of the current-term government. We have spared no effort in providing our children with equal opportunities to learn and grow, and in helping them to bring their talents into full play despite differences in background and ability." He paid tribute to colleagues of the Leisure and Cultural Services Department and the Architectural Services Department in taking forward this inclusive playground pilot scheme, giving children with different abilities equal opportunities to enjoy the fun of playing in the playground. Mr Nip also visited T·PARK and toured its incineration, power generation, desalination and sludge treatment facilities. 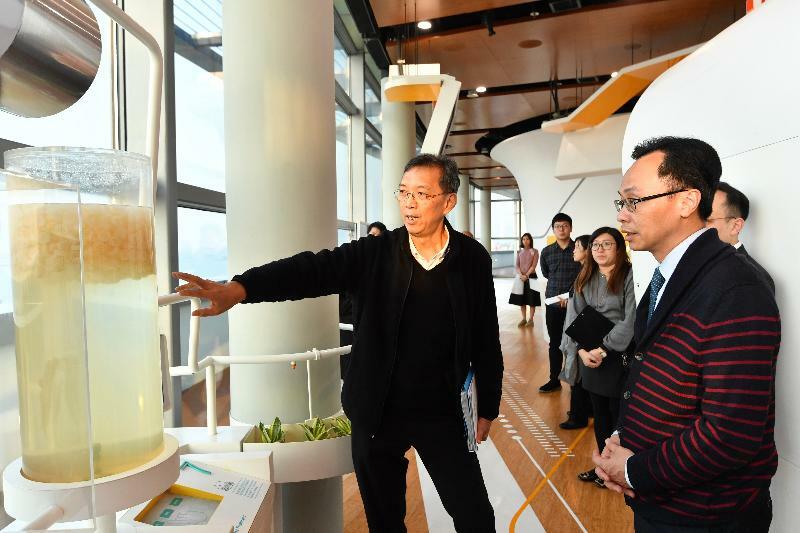 He was briefed on the sludge incineration technology adopted at T·PARK as well as its waste-to-energy process, and learned more about the concepts of sustainable development behind the park and the operation of its various self-sustaining facilities. Mr Nip was also briefed by colleagues from the Environmental Protection Department on waste recycling in Hong Kong.